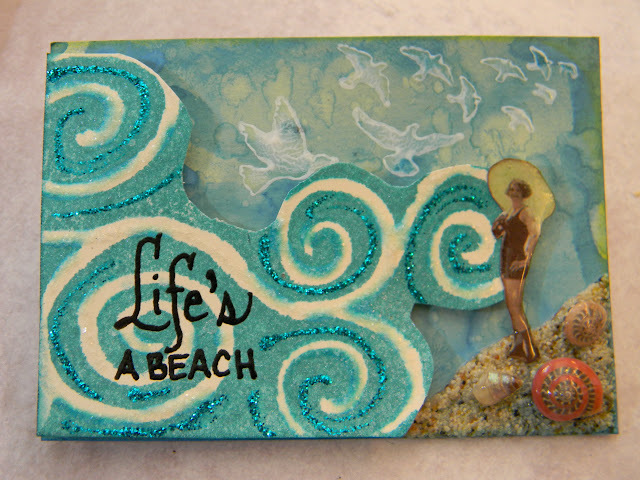 The Artful Maven: Life's A Beach!?! I love the ocean...there is something so powerful about it...almost spiritual. Once Spring and Summer roll around, I want all my getaways to be by the water. So when the theme this month for the ATC swap at the All Things Tim Yahoo Group was "Life's A Beach", I was happy to get creating! Then, over at Inspiration Journal, the monthly challenge was "Create A Little Sunshine", so I was even more happy! And then, the challenge at Unruly Paper Arts - Reader Art Quest 1, was "A Spring Thing", so the happiness really runneth over! If it wasn't for all these challenges, I might not be so happy!!! Or...should that be...BUSY?!? I went with a marbled stains background....love this technique. The Picket Fence Stain is so unique, and this technique just wouldn't look the same without it. I had so much ink on the mat so I was able to also do a tag. I flicked water on all of them. I stamped Tim's image of swirls that are now waves for my ocean, in Peacock Feathers. I sprayed Perfect Pearls Mist on for added shimmer. I cut around the image to create my waves. While at the Great American Scrapbook Convention, I found the greatest stuff. Mudd Puddles makes all these sands and embellishments for ocean life...love them!!!! Shells in a jar...who knew?!? I stamped the flock of seagulls (hehehehe) image with Snow White (...and I raannn, I ran so far awaayyy) Acrylic Paint Dabber. A hand written sentiment, a beach comber covered in Glossy Accents, some border ink, and a little Stickles finished this off. Ola la, this is gorgeous! Love the sand effect of the mudd puddles too! I want to go to the beach now too! But here it's very rainy and cold for the time of the year. Hope it will change soon! I love it! It's beautiful and the seashells are awesome. Love that you used the "Flock of Seagulls" too, I love that song!! HAHA! Very cool!! I love the 'sand'. LOVE! Makes me want to go walk on the beach...which I can do since I'm only about 8 miles from it!! This is so rich in texture and colour. It's really amazing. Great combination of techniques, too. Thank you so much for the step by step explanation. I really appreciate you taking the extra time and effort to do that! Very pretty. Love all of the textures. Looks like you had a ton of fun with these! Love the swirly waves, sand and shells... bring on the beach! Fantastic, great texture and wonderful summer feeling. These are delightful, Anita, and perfect for the Spring Thing Reader's Art Quest at UPA! Shells in a jar--I did NOT know!! Gorgeous scene! Love all those great waves! Thanks for questing with us at UPA! Don't forget to come back and vote for your favorite entry on the 26th! These are so cool! Love the design and all the neat embellies you used ... must find some of these Mudd Puddle products! Had to LOL with your Flock of Seagulls lyrics ... been awhile since I heard that one! Sending big huggies!!!! A Honey Of A Tag! Buttons, Burlap, And Pink...Oh My!!! Frame's The Name Of The Game!